It’s no secret that often Call Center is the first point of contact between business and end customer. It is very important that the customer walks away from the interaction, especially the first one, highly satisfied with the service. Poor first-call resolution and long call center waiting time are among some of the major issues for the customer to change a service provider, if the service alternative is available. Many Call center solutions that exist on the market today provide many features, but are challenging in integration with existing internal systems. They require multiple logins and switching between several screens for the information retrieval. CC-Interactive offers the solution that allows to increase call center agents’ productivity by giving them the right tools to resolve customer issues much quicker as well as seize up-sales and cross-sales opportunities. Contact Center Manager provides a more effective and efficient communication with customers and prospects. The module is tightly integrated with telephony platform solutions. The module has pre-set integration with the Telephony Platforms including inbound, outbound and transferred call routing, so that Customer File is automatically opened once the customer calls in. Contact Center Manager also supports click-to-dial functionality and allows the user to dial the customer with just a few clicks. All calls with all related contact details are logged into the telephony system. Instant screen Pop-Up – delivers call details and customer history to the agent, so that the agent can personalize their approach before the interaction starts. Click-to-Dial – allows making outbound calls from customer profile. Reduces time waste and errors. 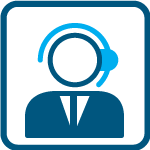 Call Back Manager (CBM) – the solution is aimed at managing call back requests from customers. CBM is tightly integrated with the telephony platform, CIP. Contact History – the module is used for storing and viewing the ‘why’ reasons of customer calls. The module is connected with the complaint registration process and is integrated with Agenda for follow-up actions. All call history is stored in the system and is available for reporting purposes. Instant screen Pop-Up delivers call details and customer history to the agent. Our solution is customizable and is easily integrated with Core Banking systems, Global Compliance solutions, Financial Monitoring systems, CRMs etc.